There is a large gap between what you learn in college and the practical knowhow demanded in the working environment, running and maintaining electrical equipment and control circuits. Practical Troubleshooting of Electrical Equipment and Control Circuits focuses on the hands-on knowledge and rules-of-thumb that will help engineers and employers by increasing knowledge and skills, leading to improved equipment productivity and reduced maintenance costs. 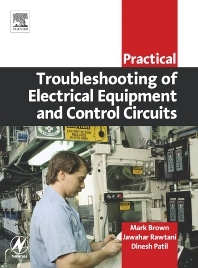 Practical Troubleshooting of Electrical Equipment and Control Circuits will help engineers and technicians to identify, prevent and fix common electrical equipment and control circuits. The emphasis is on practical issues that go beyond typical electrical principles, providing a tool-kit of skills in solving electrical problems, ranging from control circuits to motors and variable speed drives. The examples in the book are designed to be applicable to any facility. Mark is an Australian Physiotherapy Association titled Sport Physiotherapist, a Fellow of the Australian Sports Medicine Federation, and also a Fellow of the Australian Institute of Management. He is currently the Executive Officer of the Sports Medicine Australia Queensland Branch, and also holds adjunct academic positions as Associate Professor in the Griffith Health Institute at Griffith University and Assistant Professor of Physiotherapy in the School of Health Sciences and Medicine at Bond University. His previous positions include the Executive Director of the Australian Physiotherapy Association New South Wales Branch and the Director of Physiotherapy for the Sydney 2000 Olympic and Paralympic Games. Mark’s international sports event experience as a Sports Physiotherapist also includes the Athens 2004 Olympic Games, the Melbourne 2006 Commonwealth Games and the Vancouver 2010 Olympic Winter Games, as well as numerous other national and international events. APA Sports Physiotherapist, Fellow, Australian Sports Medicine Federation (FASMF), Assistant Professor in Physiotherapy Bond University Senior Staff Engineer, IDC Technologies, Perth, Australia. Jawahar’s focus over the past few years has been in the project planning, engineering and commissioning of process control systems and instrumentation systems for two 1 Mtpa cement plants from conceptual stage to production. His experience has extended to installation of instrumentation to programming and configuration of the PLC’s and distributed control systems. He has collaborated in the writing of a number of the IDC Technologies books with solid expertise in Motion Control, alarm management, SCADA systems and latterly Distributed Control Systems. Dinesh’s focus for the past five years has been in the hardware and software commissioning of steel plants. He has worked extensively with the Siemens and Schneider Electric range of PLC’s and has commissioned a number of Woodward governor based systems for the associated power systems. He has also built up a solid background in instrumentation with extensive practical experience in devices such as pressure transmitters, temperature sensors, nucleonic gauges and proximity detectors. Automation Engineer for alloy production company, Ahmedabad, India.